Additional MSAs in the region include Bryan-College Station, Killeen-Temple-Fort Hood, and Waco. Twelve micropolitan statistical areas are within the Triangle, which includes 66 counties. Beaumont, located east of Houston, has been considered part of the Texas Triangle by numerous studies dating from 2000. Burleson County is the center of the Texas Triangle. Sizable metro areas in Texas outside the Triangle are Corpus Christi, El Paso, Lubbock, Midland-Odessa, Abilene, San Angelo, Laredo, Amarillo, Tyler, Longview, Wichita Falls, and the Rio Grande Valley. The cities and counties in or near the Texas Triangle, a megaregion of the US state of Texas: City names in bold in the map legend are in the top 10 most populous Texas cities. 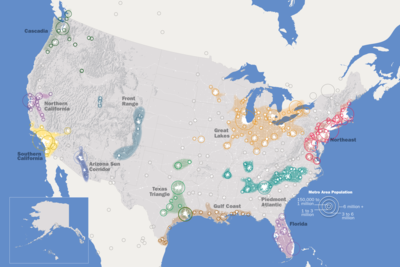 The megaregion is defined in work by America 2050 and others. Dr. Robert Lang of the Metropolitan Institute at Virginia Tech characterized Dallas–Fort Worth as one of the earliest recognized megapolitans. Although each city is distinct, Dallas and Fort Worth developed closely enough to form the urban area widely known as " The Metroplex". A conference about the future of the Texas Triangle was held by Houston Tomorrow and America 2050 on September 24–25, 2009 in Houston. The 60,000-square-mile (160,000 km2) region contains most of the state's largest cities and metropolitan areas, and in 2008 had a total of 17 million people, nearly 75% of Texas's total population. The region is comparable to Florida in population and comparable to Georgia in area, but the Texas Triangle comprises less than a quarter of Texas's total land area. Image of the Texas Triangle at night from the International Space Station in June 2013. Houston is at the bottom, Dallas at the top, and San Antonio at the far left (with Austin nearby). Sixty-six counties are within the Texas Triangle. They are: Atascosa, Austin, Bandera, Bastrop, Bell, Bexar, Brazoria, Brazos, Burleson, Caldwell, Chambers, Collin, Colorado, Comal, Cooke, Coryell, Dallas, Delta, Denton, Ellis, Falls, Fayette, Fort Bend, Freestone, Galveston, Gonzales, Grayson, Grimes, Guadalupe, Hardin, Harris, Hays, Henderson, Hill, Hood, Houston, Hunt, Jefferson, Johnson, Kaufman, Kendall, Lavaca, Lee, Leon, Liberty, Limestone, Madison, McLennan, Medina, Milam, Montgomery, Navarro, Orange, Parker, Rockwall, San Jacinto, Somervell, Tarrant, Travis, Walker, Waller, Washington, Wharton, Williamson, Wilson, and Wise. ^ "Houston leads rapid Texas Triangle Megaregion growth - Houston Tomorrow". houstontomorrow.org. Retrieved 2014-07-12. ^ David Winans & MODassic Marketing. "Texaplex video". ^ "The Simple Economics of the Texas Triangle - Houston Business, Jan. 2004 - FRB Dallas". Archived from the original on 2004-02-02. Retrieved 2014-07-12. ^ "Reinventing The Texas Triangle - UTexas CSD - 2009" (PDF). utexas.edu. Retrieved 2014-03-25. ^ Dan Seedah and Robert Harrison (September 2011). 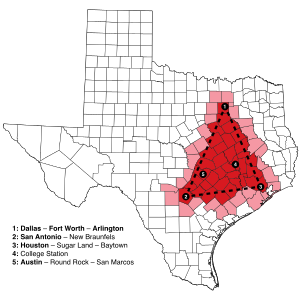 "Megaregion Freight Movements: A Case Study of the Texas Triangle" (PDF). Center for Transportation Research University of Texas at Austin (Form DOT F 1700.7 (8-72)). pp. 37–38. Retrieved November 8, 2014. ^ Michael Neuman and Elise Bright (May 2008). "TEXAS URBAN TRIANGLE Framework for future growth" (PDF). Texas Transportation Institute Texas A&M University System College Station, Texas 77843-3135. pp. 4–6. Retrieved November 8, 2014. ^ Neuman, Michael; Elise Bright (May 2008). "Texas Urban Triangle: Framework for Future Growth". SWUTC/08/167166-1. Texas A&M University System. Archived from the original on 2009-07-06. Retrieved 2009-06-21. ^ Kent Butler; Sara Hammerschmidt; Frederick Steiner; Ming Zhang (2009). "Defining The Region" (PDF). Reinventing the Texas Triangle. Center for Sustainable Development, School of Architecture, The University of Texas at Austin. p. 5. Archived from the original (pdf) on 2011-09-30. Retrieved 2011-07-25. ^ "Definition of "texaplex"". Texaplex.com. ^ "Texaplex on NBC News". NBC D/FW. ^ David Winans. "Texaplex Whitepaper" (PDF).